The little town of Matelica is in the Marche region, just east of Umbria. This region produces fine, minerally wine from the Verdicchio grape. It is also grown (with rather different results) around the town of Jesi, nearer Ancona and the Adriatic. Acid is a word that is mostly avoided when writing about wine (see Glossary), but the acidity of this wine is what makes it so lively and distinctive, and so good with food. 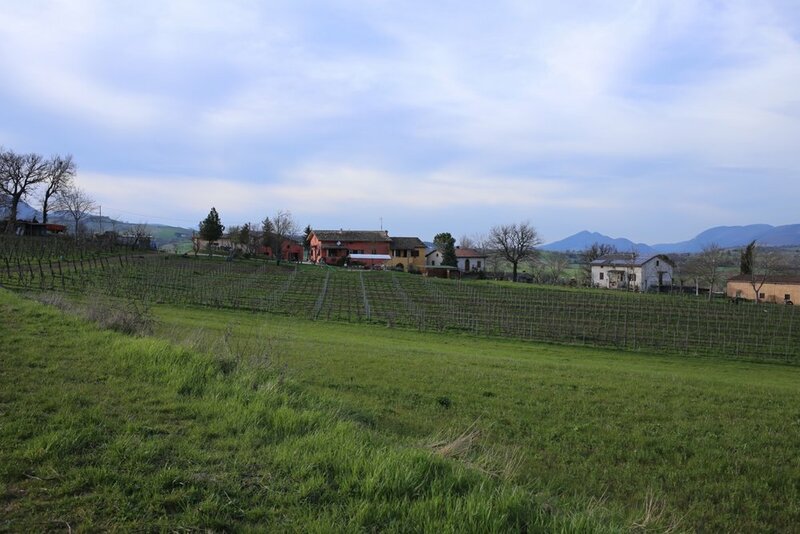 Fabio Marchionni took over the family vineyards from his father a few years ago, having just graduated from the new enology school in Ancona and done his apprenticeship in Germany. He keeps yields extremely low, less than forty hectoliters per hectare, and makes wine with painstaking care. You could eat off the floor of the winery (and hygiene is very important when making this kind of white wine). Fabio Marchionni nominated as an up and coming winemaker in the region of Le Marche by a fellow famous Marche winemaker in Decanter Magazine, May 2009. Read the review here. Italy's best classic method sparkling wines are made of native grape varieties that are high enough in acidity to provide the right base wine, and Verdicchio is a perfect candidate, particularly from Matelica. The vivid, lively flavor of the Verdicchio grape grown at some altitude is complemented here by the smoky, leesy note from aging on the lees. Excellent aperitif or seafood wine. 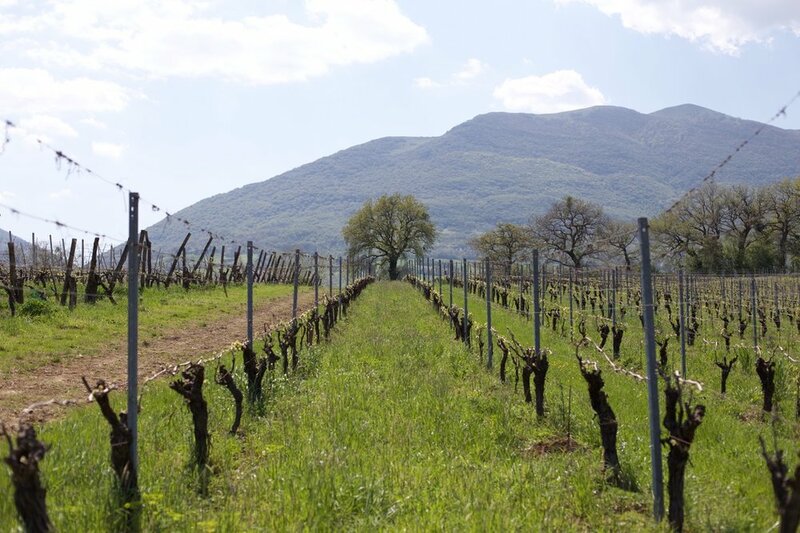 Vineyard: 1.5 hectare (3.7 acres), 25 years old, around estate which is at 420 meters (about 1,400 feet) above sea level. Fabio has farmed this north-facing vineyard organically since 1995. Vinification of sparkling wine: the base wine is bottled with yeast and 24g/bottle sugar in May following the vintage. The second fermentation takes place in the bottle, with the bottles racked in the classic 'pupitres,' as in Champagne, then the bottles are disgorged about 18 months later and re-corked, so as to leave the wine clear and sparkling (about 4 bar after disgorging). The 2012 vintage was bottled with no additional sugar, future vintages may be higher in acidity and need some added sweetness for balance. Fabio makes less than four thousand cases of Verdicchio, which he used to bottle, cork and label by hand in his tiny cantina (now he's sprung for a bottling machine). The romance isn't the point, though; the point is that this wine is racy, vivid, and excellent with all kinds of seafood dishes. It is fermented and matured entirely in stainless steel (no oak) and does not undergo malolactic fermentation. Use it like you might use a Sauvignon Blanc, because Verdicchio has some of the same herbal aroma and flavor as Sauvignon. It is a great aperitif, too, with olives and toasted almonds. I drink a lot of this wine. P.S. I give credit for this find to Gerald Weisl, the retail gadfly, who spotted Colle Stefano on the Internet. The wine is macerated with the skins for 8 hours, then fermented the same way as the Verdicchio; low temperature, all stainless steel, no MLF.